Efforts to generate a hybrid illumination technique between COL and Phase Contrast . Though the contrast enhancement effect of Phase Contrast microscopy is obviously useful, and much used worldwide, it must have occurred to many observers that its general image making capacity is somewhat compromised by the use of annuli with restricted na.. Whether this is observed directly or simply by reasoning that the phase annulus in the condenser is well within the peripheral limits of the objective's na , the fact remains that the manufacturers have chosen to gauge the phase contrast's annulus's diameter from both theoretical and practical considerations concerning long term everyday phase contrast usage in microscopy. These original constraints designed into early phase contrast equipment seem to have been copied closely ever since : a state of affairs somewhat verifiable by placing a handful of differing manufacturers phase objectives of a particular power into the turret of your phase contrast 'scope and noting that their internal annuli correspond fairly uniformly with the appropriate annulus in your phase condenser. There are of course some exceptions, such as the single sized annulus shared by both Wild's x20 & x40 phase fluotar objectives, Baker's use of 'Maltese cross' annuli and the concentric double phase annuli of the Zeiss Jena system. Moreover, the legends on Phase Contrast objectives intimate higher aperture capability in Brightfield , but effectively this is only notional since the presence of the phase annuli interferes with image fidelity, especially since the partially closed iris often applied in BF increases the proportion of image degrading light that passes through the phase annulus. It occurred to me that since the imagery raised through the employment of full aperture annuli in COL has subdued tonality, but very high resolution, it might fuse successfully into a standard Phase Contrast image. The object of this would be to generate a hybrid image with superior resolution to standard Phase contrast, but hopefully retain some of the latter's tonal enhancement. By simply making a condenser stop with 2 annuli one each for both COL and PC, the fusion of both techniques can be accomplished. But I had problems from the start. After much fraught frustration with making very thin walled annuli to dilute the COL component to suppress the washing out effect of the much duller PC image, I realised the only way to resolve this imbalance in the hybrid image was to use the more subtle light controlling properties of crossed polars. The diagram above shows the principal of the 'mixing' of the two illumination techniques. Whereas last month's article dealt with the gradual 'switching' of lighting techniques, here we have continuous light intensity control of the outer annulus by simply rotating either POL 1 or POL 2 through 90 degrees. 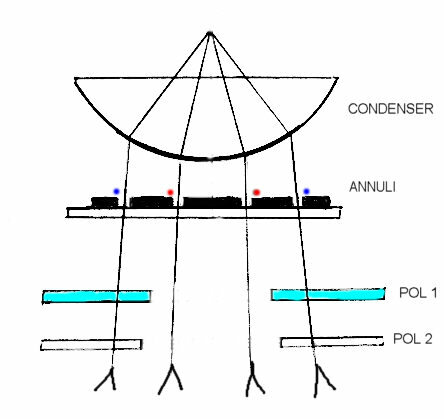 Note that the Phase contrast image making annulus is left in its normal state allowing light from the lamphouse up through the central perforation of both polar film planes. We can therefore, by gradually rotating either one of the POL planes, add enough image making light from the COL annulus to modify or hybridise the Phase contrast image to suit the specimen under observation, or at least try to satisfy our own expectations of it. The idea of fusing two stand alone imaging techiques might appear rather pointless, and indeed the image so produced will not impress anyone if the balance is not correct, and also if using a specimen which is inappropriate. Success can only come about by very careful attention to being able to fuse in a small component of max na COL imagery to the PC image. Anything beyond this is pointless and results in useless milky imagery. Being able to smoothly and continuously adjust the mix ratio of COL into the Phase contrast image for differing subjects allows personalisation of the results, with an important bonus too. Since our initial perceptions of a new hybrid image will inevitably take some time to settle, any changes in how we relate to this new imagery can be accommodated by subtle changes in the POL settings as time goes by. 1) I'd strongly advise the employment of a very thin walled COL annulus, with sufficient na to just skirt the inner peripheral boundary of the objective's back lens as seen down the phase telescope or Bertrand lens. By so doing you will ensure that its imagery has the maximum resolution and compatible tonality to transfer to the prime Phase Contrast image. Use of a narrower and thick walled COL annulus would be counterproductive and only serve to flood the Phase Contrast image without supplimenting any useful detail into it. 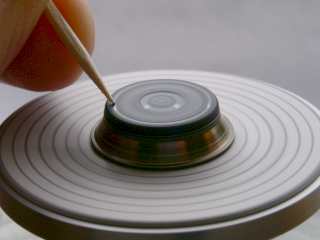 The accuracy of concentricity between the 2 annuli is paramount, and their generating will be made infinitely easier using the 'potter's wheel' technique or careful use of a mounting table. 2) You can gauge the diameter of the central aperture of the Polar tiers by simply observing the effects of introducing a cardboard cutout in the illumination train. Or you can place an appropriately formed piece of polar film directly on top of the double annulus in the substage condenser. The size of the hole in this will be small but can be neatly punctured using a hand punch. So long as the perforation is well away from either of the annuli's edges its accuracy is not an issue. Its flatness is however vital, so mechanically ensuring this can be achieved wherever it is sited is important. Polar film/filter properties seem to vary, especially in their efficiency to block light when crossed accurately. Since the COL component in the hybrid image is minimal, any intrinisc light leakage through crossed polars might spoil the effects. By doubling up tiers POL 1 & POL 2 with two films each instead of the single film, we can almost totally eliminate light leakage. Both pairs need to be in phase with each other, but when accurately crossed as pairs, the effect is dramatically improved. Fortunately despite more overall light loss through the double pairing of the polars, there will still be more than enough light to experiment with from the COL annulus. 4) The need for an achromatic/aplanatic condenser, seems to be essential here as there is a need for both annuli to be illuminated with error free light from the lamphouse. The Abbe seems inadequate for this job, with or without diffusion Köhler lighting. Since most 'polar' microscopes include analyser plates between the objective and the eyepiece it follows that owning one clearly has its advantages. The 'mixing light' setup can be therefore greatly simplified by just requiring a perforated polar film insert on the condenser's stop or just beneath in the filter tray. The analyser will still control the COL component, but the PC image will be a little duller than that generated in the technique illustrated above, but the effects are basically similar. Of course mixing lighting techniques might seem pointless to some readers, but the simple fact is that brightfield illumination is effectively a broad band illumination mixture by default. Only when discrete samples of BF are observed by use of selective stops does that notion become apparent. Perhaps the concept of BF might not be construed as being so pure after all, but being in fact a composite of an infinite fusion of many? Its popularity stems from its ability of not failing to furnish a recognisable image in all sorts of microscopes from toys to advanced stands, from either careful or even desultory use. No other illumination technique is as robust as Brightfield, nor as dependable. The possibilities of tailoring specific lighting techniques into your personal scheme of microscopy using polar control are extensive, bounded only by the limits of your imagination. I'm sure even the simplest form of 'switching' from polar control will prove a rewarding addition to your 'covert' observations of aquatic life! Published in the November 2007 edition of Micscape.